Since release in 2013, Wudtone’s trem technology has become highly regarded for its ability to drive enhanced dynamics, sustain, tone and completely stabilised tuning. Wudtone tremolos continue to delight guitarists all over the world, giving them confidence to take their performance, enjoyment of electric guitar playing to a new level. Crispin Weir, Fender Custom Shop dealer, Regent Sounds, Denmark Street. 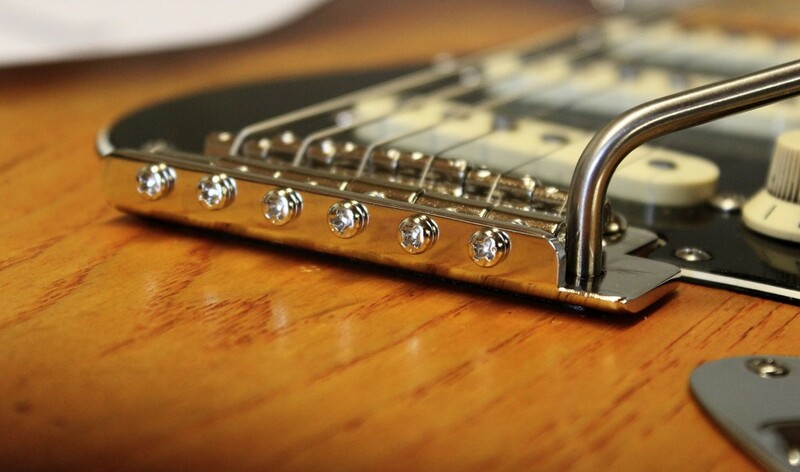 The issue with Leo Fender’s original style bridge ( indeed any retro copy with a flat plate top surface), is simply that the screw heads foul on the top surface of the plate as it tilts. This causes the plate to have to slide up and down the screws and this changes the pivot point, which de-stabilises the tuning accuracy. You can see this problem manifest itself in the video below. Wudtone has developed a solution by adding recesses on the top surface of the plate. With these recesses providing the required relief, the screw heads no longer foul on the top of the plate, the plate doesn’t have to slide up and down the screws and so it tilts with a constant pivot point and tuning is completely stabilised. If you wish to look at more design detail head over to this blog post which has some more history, detailed drawings. Enhancing dynamic, sustain and tone. Despite the problems with tuning, Leo Fender’s original style trems remain an option from Fender, largely because of the desirable dynamic and tone they deliver. Leo’s original design simply screws onto and has contact with the body of the guitar. Tremolo inventions that have followed in the 70’s, early 80’s, including, Fender’s 2 pivot post, PRS grooved screw, Ernie Ball Luke , Floyd Rose all employ indentations in their fixings. This approach engineers more stable tuning, but at the same time has the disadvantage of lifting the bridge plate off the body of the guitar and so this fundamentally changes the dynamics of a guitar. Many guitarists now understand the reasons why and consider the dynamic and tones delivered by these later inventions to be inferior. Having recognised the reason behind the dynamic / tone advantages of Leo’s original design, Wudtone has added enhancements which not only preserve plate contact but extend it and improve it, thereby delivering even more dynamic efficiency and benefit. Wudtone trems have the unique features below which all work together to achieve this. Firstly the bridge plates do not have the usual countersinks on the underside. Reliefs are milled accurately with the minimum amount of metal removed. This maximises the area of available contact on the underside of the bridge. Secondly the bridge plate is sat on a full width stainless steel shim. This shim acts as a whacker plate onto the body of the guitar. It also helps to provide a smoother action, more precise feel along with a fit and forget set up. These unique features maximise contact between the metal of the tremolo unit and the body of the guitar. This delivers an instantly audible boost in dynamics, unplugged volume. The energies being put into the strings by you as guitarist have a much more efficient path the guitar itself. The guitar resonates better with these energies, which loop back into the strings and so on. Some customers may want to nail the sounds of a pre-CBS, s-type guitar. Some customers, self-builders, PRS enthusiasts, as well leading custom guitar builders, simply want the most dynamic, sustain from their guitars. To meet both of these needs Wudtone offers two versions of their trem design and they deliver different tone character, dynamic efficiency because of the different material used. The Wudtone CP Vintage 50s is made from materials equivalent to those used on the original pre-CBS S-type guitars. It has the rear bar formed in the same way, part of the rear bar cut away so visually looks exactly like a vintage style trem and you can even fit the old style trem cover if you wish. All the latest Wudtone CP Vintage 50s based options, including bridge plate only or complete tremolo assembly, and Vintage Reload guitars are available in our online shop here. The Wudtone HOLY GRAIL is made from much higher tensile steel. It is around 3 1/2 times as hard as the original plates. Indeed it is the hardest metal we have so far been able to machine with modern tooling. The plate cannot be bent and so has a separate rear bar and this gives it a more modern look, comfy feel underhand. This produces a trem that operates with what we firmly believe is the most dynamic efficiency of any available on the market today. All the latest Wudtone HOLY GRAIL based options, including bridge plate only or complete tremolo assembly are available in our online shop here. Best of both worlds, trem arm fixing. There is nothing worse than a load of old trem arm slack. This means you have little precise control for neat effects such as chord shimmers. The other problem some guitarists experience is arm breakages when threads are placed at the top of a block. 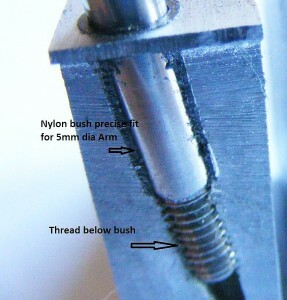 This causes a weak point where there is most stress on the trem arm. Any risk of the trem arm pulling out by accident during some moment of extreme whammy ectasy is also a complete no no. To solve all these problems, Wudtone employs both a nylon bush and threads in the construction of our 1018 cold steel blocks, to deliver a best of both worlds approach. A nylon bush is inserted into the top of the block, precise engineered to support a 5mm stainless steel trem arm which eliminates any slack. We use improved 5mm diameter stainless steel for strength and some malleability and have never had a single arm break reported. The threads below the bush, fix the height and also prevent any accidental pull out with any amount of some extreme whammy action. You can adjust the arm swing tension with more or less turns into the threads. Another nice feature are the milled string guides we have added to a number of the bridge plates. These help to avoid tension differences as the string come up out of the plate and over the saddles. Avoiding tension differences helps to improve tuning stability as well as minimise string breaks. String breaks can often occur at the point a string exits the bridge plate. The is usually due to a hard break angle without any suitable shaping or often ridges caused by worn tooling being used to cut countersinks. The milled string guides completely eliminate these potential issues. The Wudtone trems are designed and made in the UK. They are supplied as complete tremolo assemblies or after part upgrades for, Fender Vintage, Fender MIM Standard, Fender American Standard , Classic Player, other hybrid (eg Fender Highway 1) type guitars and also PRS. The full range of options are in our online shop here . Combine with the Wudtone 1018 Cold Steel Tone Block to maximise clarity, sustain, resonance! If you have an American Standard / Deluxe Stratocaster and want convert to an enhanced body connected Wudtone trem, for some real dynamic and vintage tone, we now have an easy fit conversion just for you. More info on the American Standard Conversion here. The PRS six grooved screw approach offers great tuning stability but it also lifts the bridge plate off the body. The Wudtone technology applied to a PRS brings the bridge plate back down in contact with the body of the guitar and thereby works with better dynamic efficiency, less reduction and total tuning stability. If you want a fuller guitar tone with less compression, more dynamic response, detail, clarity, the Wudtone PRS DD (dynamic de-compression) upgrade is for you. The results reviews from PRS fans are astounding. The video below demonstrates the remarkable improvements the Wudtone PRS DD upgrade will deliver.